When I was brought onto the design team for Hard Time, I had no idea what to expect. As an intern, was I actually going to be writing cards, making comments, and giving feedback on other people’s work? Or just sitting back until someone needs coffee? In order: Yes, yes, yes, and no. At our first meeting together, we outlined the goals and focus of the set. One of the original goals was to work in some ideas to boost Commodity cards and trade/commerce as a theme. I spent the next week thinking about what I could suggest that would be new or different. In a strange moment of clarity I had something I knew I could pitch. What about finally doing something with Smugglers? When was the last time you used any cards that reference the Smuggler keyword? If your answer is anything more recent than “never”, I don’t blame you. 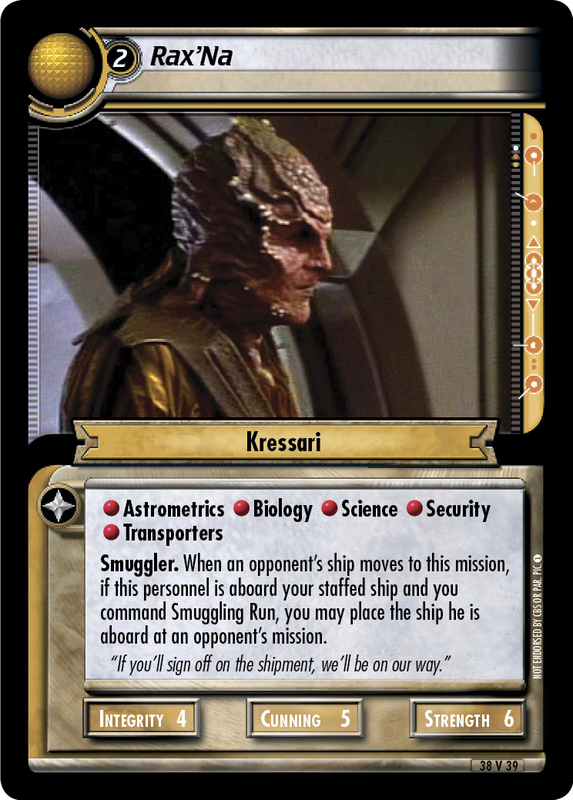 There have been Smuggler personnel since the very beginning of Second Edition, twenty-four (24) before the release of this set across six (6) affiliations, and in all this time only three (3) cards have ever referenced that keyword: Morn, Barfly (extra card draw also triggers with Thief, so not exclusive), Jean-Luc Picard, Galen (attribute boost also benefits Thief personnel, not exclusive either), and Smuggling Run. No one plays Smuggling Run! At the time of writing, there is one (1) recent deck using Smuggling Run, only one copy, and it’s a Maquis deck. Crime. Plays in your core. At the start of each of your turns, if your Smuggler is at an opponent’s mission, that opponent has no ship at that mission, and your personnel at that mission have its requirements, you may destroy this event to score 10 points. So you need to start the turn at an opponent’s mission, not leaving your crew at your own to attempt next turn and not at headquarters either. Your opponent has their whole turn to potentially come drop off some ship or destroy your event without needing to prevent it from being played. Also you don’t know what missions your opponent will play when you build your deck and put your personnel selections. Wow, that’s a lot to work around for only 10 points of benefit. I see why no one really could build around this card. Let’s see if we can change that. First, let’s look at the barrier of being at your opponent’s mission where they have no ships present. Right now all they have to do is come over and park at the end of their turn, maybe even attempt that mission and stay there whether they complete or fail, and you are locked out for a turn unless you have ships at all their missions and enough people to do all of them. Ok, I’ll stop right there since by that point your opponent is already done with their game and picking up their cards. So, we need to get clear of other ships. Rax’Na at your service! This spiffy non-unique boasts five (5) skills and the answer to your first problem. His ability lets you avoid an opponent’s ship coming to the mission he is at by relocating the ship he is on to one of your opponent’s missions while you command a copy of Smuggling Run. Cool! Now you can sneak away when the authorities come to check your cargo. You could also avoid an incoming engagement by bouncing to another mission when your opponents come calling. Ok, so that’s one down, now what about meeting requirements that you don’t know in advance? Allow me to introduce you to Brathaw, First Mate. The latest model of the Maquis’ favorite Bolian comes with four (4) skills, slightly above average attributes, and a killer ability that takes care of that skill gap you weren’t expecting. At the start of your turn, you can discard a card from your hand to gain a skill required by the mission he is at. Missing that Intelligence against someone playing an Enabran Tain, “Retired” Spymaster deck? He’s got you covered, for the whole turn! Even if you’re not out making smuggling runs, he can get you another copy of a skill you need to solve one of your missions in a pinch. All for the low cost of one card, what a deal! But wait, you get your ship to your opponent’s mission, you’ve avoided their ships, what about your opponent just blowing up Smuggling Run in the first place before you have a chance to score points? Making your run wouldn’t be possible without a ship, so how about a ship that protects your “cargo”? Calondon, Gunrunner is your ship! 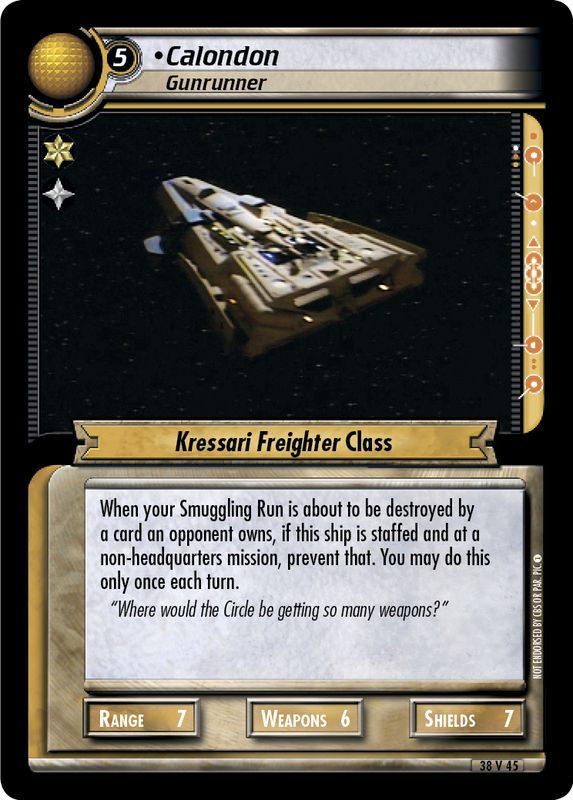 If a card your opponent owns tries to destroy Smuggling Run while it’s parked at one of their missions, your ship can prevent that, once per turn. If your opponent really wants to commit to blowing up your event to prevent those points, there is another Smuggler (Kasidy Yates, Maquis Smuggler to be exact) that can retrieve Smuggling Run from your discard pile for later use. Now, you should be able to go and smuggle your goods to your heart’s content. But wait, there’s more! You’ve already seen a nifty tool (Commodity) we made in Denevan Crystals, giving all your Smuggler personnel Acquisition which then means they can benefit from other Commodity cards like Felicium and Tulaberry Wine, not to mention gain a rare skill that surprisingly isn’t as widespread among them. We also have some other abilities and a wide array of skills, that you’ll see on personnel yet to be revealed, that add extra love to the group. With a little extra boost, you might even be able to turn your game into a two-mission win! While we didn’t start out with the goal of fixing one old card with some new faces, I think we at least made a forgotten Event playable and also gave the Smuggler keyword some meaning at last. I really hope you all have as good a time playing with these cards as we did making them for you, and we are sure you’ll find even more possibilities within other decks and with the already existing stable of Smuggler personnel. Fun fact: Klingons have the 2nd most Smuggler personnel after Non-Aligned.